Life Insurance Policy Investment Returns – How To Calculate. When you are planning to invest in an Insurance Policy, it is natural to doubt whether it is the best investment option available to you at that point of time. You may be also eager to know how much investment returns you will get from the policy. 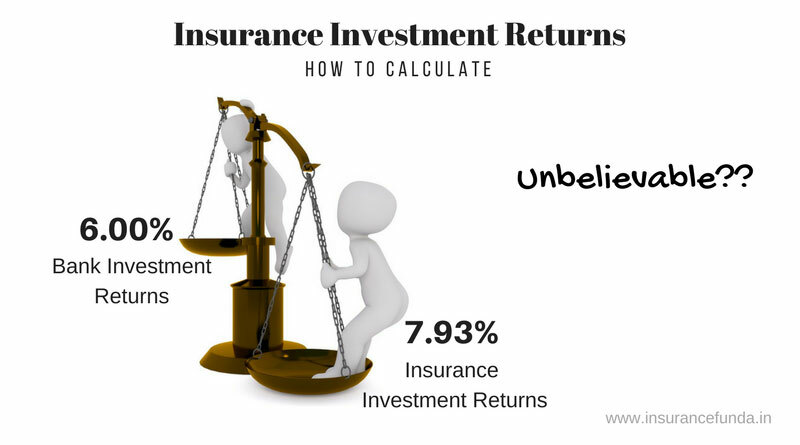 In this post let us have a detailed discussion about methods to calculate the investment returns of an insurance policy. Before going into the investment return calculations, it is good the know the major types of policies available in the market. 1. Conventional policies: These are the most popular type of life insurance policy in the current scenario. Conventional policies include, ‘Endowment Assurance‘ (Sum assured along with accrued bonuses are paid to the policy holder at the time of maturity) and ‘Money back‘ (Sum Assured is paid as several periodical instalments and the accrued bonus is paid along with the final instalment or maturity) type of policies. 2. Unit Linked Insurance Policies (ULIP): ULIPs are specialised insurance polices where the amount is invested in the share market, bonds or money market depending on the type of the fund selected. Invested amount is converted into units based on the unit price available at the time of purchase. Maturity value or the surrender value shall be the amount equal to the unit price (available on that particular date) multiplied by the total number of units available. 3. Term Insurance Policies: Term Insurance policies are pure insurance oriented plans where no savings portion shall be available. There will be no maturity value or surrender value for these type of policies. Conventional policies or Endowment Assurance type of policies provides two types of benefits to the policy holders. So naturally the premium paid for the plan will also include elements of both these components. Before calculating the rate of returns of the plan, we should remove the insurance component from the premium paid and obtain the savings component in the policy. A simple method is to find out the premium payable for a pure term insurance policy and subtract it from the total premium payable. How to calculate the investment returns of an Insurance Policy? In order to find out the savings element in an insurance policy, let us consider the premium payable by a person for taking an Endowment Assurance Plan and a Term Assurance Plan. So, from the above calculation savings portion for a 25 year term, endowment assurance policy is Rs. 38,866 per year and the total savings portion premium comes to 8,48,900 only. For an Endowment Assurance plan, maturity amount includes following components. Approximate maturity amount calculation for the plan considered in the aforementioned example as per the current bonus rates is given below. Internal rate of any periodic investment can be easily calculated using the IRR function of Microsoft Excel. As the savings portion premium in the above mentioned example is just Rs. 33,956 and the expected maturity value* is Rs. 26,50,000 , we can calculate the Internal Rate of Return (IRR) using these values. The calculation is given in the figure given below. From the above calculation, we can understand that the Endowment Assurance policy, as mentioned in the example given above, is giving an Internal Rate of Return (IRR) of 7.93 %. Investment returns of 7.93% in the current market scenario of dwindling interest rates is really attractive from any angle of view. In the present scenario, banks are offering interest rates around 6% per annum and the rates are in the trend of going down further. Further, bank interest returns are subject to income Tax also. This again brings down the effective interest rates further. On the other hand insurance policies offer Income Tax benefits also. Premium paid is eligible for income tax rebates u/s 80 C and maturity amount is exempted from income tax u/s 10(10D) of income tax act. * Maturity value of insurance policy is calculated based on the bonus rates and may vary depending on the experiences of LIC of India.